" FL-13: GAO Finds Prior Tests Do NOT Offer 'Reasonable Assurance' That Touch-Screen Machines Were Not at Fault in Sarasota's November 2006 Election	"
As we near the one year mark since some 18,000 votes inexplicably disappeared in Sarasota County, Florida, on the Direct Recording Electronic (DRE) touch-screen voting machines used in the U.S. House Election for the state's 13th Congressional District, more study is still needed to determine whether or not the voting machines were at fault, according to the report released today by the Government Accountability Office (GAO). Even with the additional testing, the GAO admits, it will be impossible to determine for certain whether the touch-screen machines caused the extraordinarily high undervote race in the election. The GAO's report [PDF] was presented to a Congressional task force investigating the challenge brought by Democratic candidate Christine Jennings, under the Federal Contested Elections Act, after the certified tally between her and her Republican opponent, Vern Buchanan, was reported by the state to be a slim 369 vote margin. No reasonable explanation for the massive undervote --- found only in that particular contest, only in the Sarasota portion of the race, and only on the touch-screen ballots there (as opposed to the paper-based absentee ballots) --- has yet been proven by anyone. The GAO has asked the task force to allow them to conduct further testing of the ES&S iVotronic touch-screen machines, in three specific areas, though they admit while "the proposed tests could help provide increased assurance, they would not provide absolute assurance that the iVotronic DREs did not cause the large undervote in Sarasota County." Determining for certain whether the machines caused the problem would be "impossible," according to the GAO analysis, because they are "unable to recreate the conditions of the election in which the undervote occurred." Ah, the trouble with touch-screens. As well, the report determined that "some of the prior tests and reviews conducted by the State of Florida and Sarasota County provide assurance that certain components of the voting systems in Sarasota County functioned correctly, but they are not enough to provide reasonable assurance that the iVotronic DREs did not contribute to the undervote." 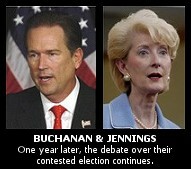 While the Congressional task force has given permission for the GAO to proceed with their additional testing of the DREs, Jennings has already announced her intentions to run again in 2008 and Buchanan has voted for almost a full year with the Republican House caucus. And Democrats in the House prepare to vote on legislation which would allow the same faulty technology to be used in further elections. Among the unanswered questions in any of the FL-13 reports so far, is whether or not the source code reviewed in previous studies was the same as the code actually in use in the machines on Election Day. Recent news out of California demonstrates that ES&S has a prior history of playing fast and loose with different versions of hardware and software used on their machines in elections. During the course of California Sec. of State Debra Bowen's landmark independent "Top-to-Bottom Review" of certified voting systems in California, ES&S had refused to supply source code for the company's InkaVote system used in Los Angeles to her University of California testers. Only a threat to take the source code out of state escrow forced the company to turn over the code, along with a demand that Bowen's computer scientists not work from the escrowed version. As The BRAD BLOG first reported last July, Bowen's team subsequently found that the version of the source code supplied by ES&S was different from the one used for certification and as stored in escrow by state law. Further, in August, Bowen then announced that she had discovered ES&S had deployed a different version of the AutoMARK voting system from the one which had been certified for use in the state of California on 1000 different machines. In 2004 a similar use of uncertified touch-screen systems by Diebold, Inc., had led to the decertification of its systems in the state. A hearing is pending this month to determine what the penalties will be for ES&S. One of the three additional tests the GAO plans to conduct in their investigation of ES&S's FL-13 machines is to try and determine whether or not the machines and source code used in prior testing match the firmware used in the voting machines in Sarasota County, Florida, on election day. A "key shortcoming" of both their own study and the prior study commissioned and run by the state of Florida "was the lack of assurance whether the source code reviewed...if compiled, would correspond to the iVotronic firmware that was used in Sarasota County for the 2006 election." The GAO found that "prior testing and activities do not provide reasonable assurance that all iVotronic DREs used in Sarasota County on election day were using the hardware and firmware certified for use by the Florida Division of Elections." Another troubling note was revealed deeper inside the GAO's study. They report that ES&S officials, who, along with the state of Florida and Sarasota County, were allowed to review the study before its release today, admitted they were unable to provide the results of earlier tests they claimed were performed on the machines. The results of tests performed on Sarasota's iVotronics back in 2001 and 2002 were unavailable "because the documentation had not been retained," according to the company. As well, ES&S told the GAO that they felt "the collective results of prior testing have demonstrated that the voting systems worked properly in Florida’s 13th Congressional District race." The GAO did not concur with ES&S' assessment. "We disagree that the prior test results adequately demonstrate that the voting systems could not have contributed to the undervote," they wrote in reply. The scope of the GAO's report was to determine whether or not the ES&S iVotronic systems used on Election Day in November 2006 contributed to the extraordinarily high undervote rate. So far, they say, they have been unable to reach "reasonable assurance" that machine malfunction or tampering played a roll. While they admit it will be impossible to determine one way or another, they hope the additional testing will provide such a "reasonable assurance." In the meantime, during the same election last November, citizens in Sarasota voted to move to an election system which included a "paper trail" record of their votes. The FL-13 debacle, however, led Florida's new Republican Governor, Charlie Christ, to move the state's Republican legislature to ban DRE voting machines entirely. And yet, even with all of that, Congressional Democrats in the U.S. House prepare to vote --- as early as next week, if Majority Leader Steny Hoyer has his way --- on Rush Holt's (D-NJ) Election Reform bill (HR 811). Despite multiple warnings from computer scientists and security experts, as well as many election integrity advocates, Holt's bill would nonetheless allow for the continued use of the same type of DRE voting technology which, even a year later, one scientific study after another has failed to show as accurately having reflected the intent of Sarasota's voters. Portions of the Florida state audit, such as the firmware comparison and parallel tests, provided useful information, but the results could not be applied to all the iVotronic DREs used in the election because the number of machines tested was too small. Additionally, the machines were not tested for all different ways a voter can select a candidate in the congressional race. We also did not find any prior testing that would help us understand the effects of a miscalibrated touch screen. Our proposed tests could help reduce the possibility that the undervote was caused by the iVotronic DREs. However, even after completing the tests, we would not have absolute assurance that the iVotronic DREs did not play any role in the large undervote. Absolute assurance is impossible to achieve because we are unable to recreate the conditions of the election in which the undervote occurred. We concluded that the results from the testing of 10 machines cannot be applied to all 1,499 iVotronic DREs used during the 2006 general election because the sample was not random and the sample size was too small. Out of 112 different ways to select a candidate in the congressional race, Florida certification tests and the Sarasota County logic and accuracy tests verified 3 ways to select a candidate; and the Florida parallel tests verified 10 ways to select a candidate—meaning that of the 112 ways, 13 have been tested. By not verifying these different ways to select a candidate, we do not have reasonable assurance that the system will properly handle expected forms of voter behavior. Our proposed tests involving the firmware comparison, ballot testing, and calibration testing could help reduce the possibility that the undervote was caused by the iVotronic DREs. However, even after completing the tests, we would not have absolute assurance that the iVotronic DREs did not play any role in the large undervote. Absolute assurance is impossible to achieve because we are unable to recreate the conditions of the election in which the undervote occurred. "FL-13: GAO Finds Prior Tests Do NOT Offer 'Reasonable Assurance' That Touch-Screen Machines Were Not at Fault in Sarasota's November 2006 Election"
See related article by Kim Zetter at Wired.com. Anything is the report, or from other sources you know of, indicating whether the massive undervotes where associated with particular machines, particular precincts, or whether the undervotes were purely random throughout the county? I read recently somewhere that 18,000 is far from the highest undervote in that Congressional District, or its equivalent in the previous redistricting, in the past. But I remember that someone stated there had been a 25,000 undervote not that long ago, BEFORE the DREs. Any truth to that? Can we play "fact or crap" on that? and it mentions a previous 12,000 undervote. Other things that came up in the google search said that the 18,000 seen in the last mid-term was 1/6th of this one, so unless it was the 2004 election with the undervote it was 2000 or a previous election. So, 25,000 hasn't shown up. This guy was basically telling Jennings "tough luck" so I think he would have made his strongest case. So, he's either a lousy researcher, or the 25,000 didn't happen. He didn't mention that the people that did the post-election "study" had at least one person who had been involved in the selection of the voting machines (as Bradblog reported), so it could be both. Sorry, I didn't close the link, but it still works. The GAO report says the undervote was spread throughout the county, in general. At the polling places, anyway, if not on the paper-based absentee ballots. From the report [PDF]: "The undervotes in Sarasota County for the congressional race were generally distributed across all machines and precincts." Reports of previous high undervote numbers in that county took place during the 2004 general election. The percentage was much lower, but the numbers were high because there were many more voters in the 2004 Presidential Election than in the '06 mid-terms. Hey, they are getting better and better at stealing. Maybe they WILL hold the 2008 elections after all. They will have "lost" 5-8 million poor and black voters off the rolls, made it difficult for another 20 to 40 million with poll-tax-style ID rules (SCOTUS will uphold those, you can be sure), and then can fix the rest with spoiled ballots, undervotes, lost votes, last minute votes discovered during secret counting after false terrorist threats, and every other kind of subturfuge. Folks, the Rethuglicans have this game fixed, and I don't think we're going to find a way out in time. Did the GAO Report, or any other study, examine the event logs and audit logs from the central tabulator and from a random sample (large) of the actual IVotronics? Examining the "source code" would have to include the firmware and custom ballot definitions. Once again the burden of evidence has been placed on the wrong parties. The undervote rate was statistically impossible without error or manipulation. That should place the burden upon the vendor and the county to provide evidence that the undervotes were not caused by the DRE's. The fact is there was a massive undervote reported just for that race in that county. It is up to the county and vendor to prove why. As for the machines, we know from the testimony presented at the Evidentiary Hearings from CHARLES STEWART that the machines prepared AFTER OCT. 17th produced a SIGNIFICANTLY HIGHER undervote rate, which increased by percentage THE CLOSER WE GOT TO NOV. 7th. That one floored me...and yet, no word about it anywhere, EXCEPT here on BRADBLOG. When security tapes were requested through FOIA, well within the proper amount of time, we were told they had been erased. It's all in the video, so no surpise to us that the GAO is dragging it's feet. Put this together with the DAN RATHER info--we're betting we got those 15,000 defunct machines from Manilla. The problems described by the workers in that eye-opener are the same voters reported experiencing here in Sarasota. And yet we need to RETEST? All their testing has shown is that there has been insufficient testing? C'mon...I knew that by just showing up! Vendors controlling the process, Partisan State Officials with everything to lose counting our votes in back-rooms, all players unwatched and unaccountable, no records, no public observation allowed, no BALLOTS to count, sweatshop labor and insufficient testing and NO MEDIA covering it...?! "I didn't save the link." "But I remember that someone stated there had been a 25,000 undervote not that long ago, BEFORE the DREs." "Any truth to that? Can we play "fact or crap" on that?" Here is a link to the Sarasota Election Board website. Run the numbers and see what you find. Btw, they used punch card ballots in 2000. Reports of previous high undervote numbers in that county took place during the 2004 general election." Brad, if you take the time to research the facts, you will find that the highest number took place in 2000. There were 25,000 of these ballots that election. "The percentage was much lower, but the numbers were high because there were many more voters in the 2004 Presidential Election than in the '06 mid-terms." "No reasonable explanation has been offered or proven for the high undervote rate only in the FL-13 election, only at the polls, and not in any other race on the ballot (the race for Hospital board, for example, way down on the ballot had only a 2.5% or so undervote rate, versus the 15% or so undervote rate in the Jennings/Buchanan race only.)" Again, apparently you have not taken the time to do the research on the numbers. The fact is there were 9 other races with more than 22,000 or more the 16% undervoted ballots.